Dental implants are an effective way to restore your smile. They look and function like your regular teeth. Unlike dentures and dental bridges, dental implants are the only smile restoration that reverses the damage caused by missing teeth. Dentures must be removed nightly, but dental implants are part of your smile — you’ll never have to remove your dental implants for cleaning or any other reason. Dental implants as we know them today are a groundbreaking solution for restoring the gaps in your smile caused by missing teeth. They’re the result of numerous technological innovations and biomedical discoveries. The most important single breakthrough in the development of modern dental implants was the discovery of osseointegration by Swedish scientist Per-Ingvar Brånemark in 1952. Brånemark first recognized that titanium, a strong and durable material, is biocompatible, which means it fuses together with bones to create a stable bond. This makes titanium the perfect material for an implant fixture, the part of the implant that attaches to your jawbone. Although our ancient ancestors didn’t have the same understanding of dentistry that we do, they still struggled with many of the same health conditions we have today. One of the main issues they faced was tooth loss. Like modern humans, people in the ancient world suffered tooth loss as a result of trauma, gum disease, and tooth decay. These factors were exacerbated by their lack of knowledge regarding modern dental hygiene. People in ancient times obviously didn’t have the same knowledge of modern chemistry and technology we have today, but this didn’t prevent them from trying to restore damaged or missing teeth by whatever means they had available. This meant attempting to fashion dental implants from the materials around them. The ancient Mayans demonstrated impressive dental achievements despite their lack of modern technology. For example, they used shells as dental implants. The Mayans also practiced an interesting form of cosmetic dentistry — they adorned their teeth by pounding gemstones into them. The Mayans performed these procedures without anesthetic or electric drills. We can only imagine how painful this must have been! Archeologists have discovered additional examples of dental implants in the ancient world. For instance, the ancient Chinese fashioned dental implants from bamboo pegs about 4000 years ago. These pegs were inserted directly into the jawbone. The ancient Egyptians implanted prosthetic teeth made from ivory into their jawbones. They also used actual human teeth for this purpose. 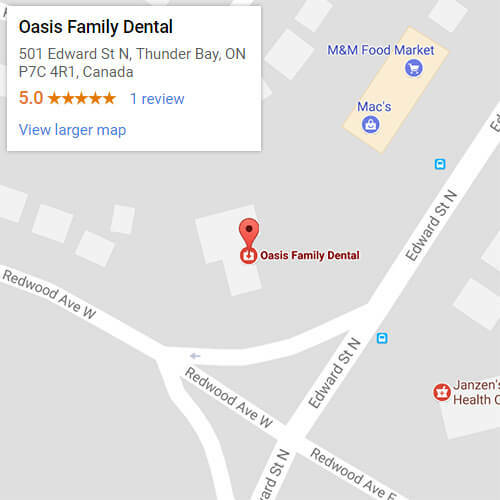 Dr. Elaine Chow at Oasis Family Dental in Thunder Bay restores smiles with beautiful and long-lasting modern dental implants. Call 807-700-1383 today to find out what dental implants can do for your smile. Or, just leave us a message in the submission form and we’ll get right back to you.